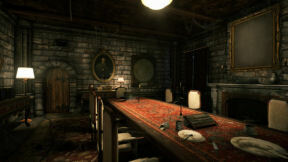 Mention that a game is Myst-like and some people run away, while others swarm like ants to a honey pot. I am part of the swarm, usually up the front, and it is a swarm with expectations. First and foremost the honey better be good; you can’t tempt and then not deliver. Having said that, it isn’t a mention the maker (one Ben Droste) made, although on his website he does refer to lights dancing in the mist, and things being shrouded in mystery. But once you know it’s a first person puzzle fest, and you read a bit about it, the description will inevitably arise. Which it did, and has, and if I was a game maker and someone referred to my game in that way, I would be chuffed. Especially if it was as good as this. Let’s not take things too far though. There are things that aren’t like Myst, or any number of sequels/clones/inspirations. 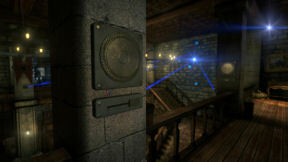 But if you like the type of game that Myst is, you will like this. “I consider people’s time to be precious, and if you are going to do me the honour of spending that time playing my game, then I owe it to you to make damn sure it’s a great experience”. We/you start in a boat, on our way to an abandoned castle off the Scottish coast, having been sent to shut down a radio signal that has suddenly begun broadcasting, and which is disrupting communications in the surrounding area. If the sudden transmission from a place supposedly uninhabited is not odd enough, the scraps of paper hinting at ghosts just adds a layer of strange. 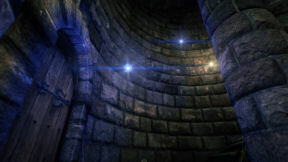 Once inside the castle, the darting blue lights just seal the deal. Also once inside, the lavishness of the thing will be apparent. Eyes of Ara looks fantastic, detailed to the nth degree. So much so that I wished I could have walked all over and poked my nose into every nook and cranny. Instead, I had to be satisfied with node to node progression and 360 degree panning from each node. While you generally can't interact with things for the sake of it (there is not a lot of opening and closing cupboards, drawers etc. just because you can) there is plenty to do and search to find the bits and pieces that you need. Take notes, because you will need to (you don’t carry notes/scraps/books/posters etc. with you), and while many of the clues to particular puzzles are close at hand, that doesn’t apply to everything. My obsessive compulsive tendencies generally result in me writing/drawing everything, but I suggest you do the same. Puzzles are the thing. There are all manner of them, from simple, to not so simple, but never diabolic. I thought some were particularly clever, and me too for solving them. I got help occasionally, and pretty much had a Homer Simpson moment on each occasion for failing to put the pieces together. Clues abound, and an astronomical theme ties many of them together, as well as providing some cohesion to the things going on. There is subtle subterfuge and misdirection in some puzzles, but I didn’t think them unfair. On the whole, that is a comment I would make about them all. On one occasion I completely missed the answer which was staring me in the face, because I had been drawn into interpreting numerous posters and books on the tables, and was convinced the answer lay within. Sometimes the obvious is the way forward. Oh, and make sure you look up. 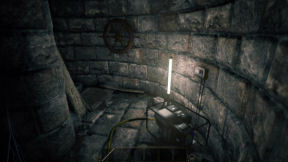 A number of puzzles are part of a treasure hunt within the game. There are objects you can find (coins and photos and other things) that are just there to be found. 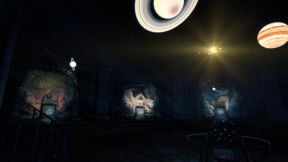 Solving these puzzles is not necessary to get to the end, but when you do, the game remains open to you, and you can go back and try and find them if you wish. A room at the end will chronicle your success to that point – I didn’t do too bad on some things, but failed miserably on others. How many of these items exist in each part of the game (and how many you have found so far), along with some items which do need to be found to finish the game, can be viewed through your inventory. This sits bottom of screen, and can be hidden from view by a click of the mouse. Inventory items are displayed (and discarded when no longer needed), and tabs each side will bring up the additional items and the game menu. At any one time you won’t have very many inventory items, and I tended to keep it out of view until I wanted it. You can combine items in the inventory, and very importantly you can examine and manipulate items. Make sure you do that, including with respect to their orientation in the game world. 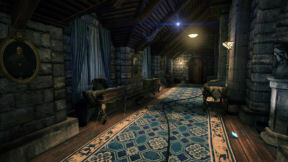 You progressively move through the castle, unlocking areas as you go. All manner of things are there to be unlocked, and there are hidden rooms, nooks and crannies waiting to be found. Given the missing treasure items, I clearly haven’t been everywhere or found every secret. A few puzzles are not the type you can solve with clues. There are three paintings where you have to manipulate the pieces to produce the final picture, and like a slider, you just have to fiddle until solved. The end puzzle is similar. While a strategic approach will improve your chances, I confess I ultimately found a couple of them frustrating rather than challenging. But they are few in the grand scheme of things and any puzzle can be frustrating if you can't solve it. While still on puzzles, just about every one of them gives feedback that you have been successful but two I can recall did not. While the cause and effect were not far apart, they weren’t in the same room, and given what had gone before I didn’t go and look, instead assuming what I was doing was wrong. They were both part of a three part solution, so once I realised I had in fact solved the first, I made sure to check the second each time I thought I might have solved it. But they were conspicuous for behaving the way the did. You can play with a hotspot cursor on or not, but I don’t know why you wouldn’t have it on. While it might indicate a single spot, it might also indicate a space which can be more closely examined and then searched (like a table top). Once you are examining however, you are largely on your own. The locked box is a bit of a give-away, but all manner of books, scrolls and boxes might be clicked on, and as far as I can recall there were no hotspots. So search carefully. A little annoyingly, a click on a non-responsive item may well throw you back out of the area you are examining, meaning a fair bit of clicking back in to thoroughly search a location. Large closets for some reason don’t get a hotspot, even when they can be opened. I don’t recall other things, but there might have been some. I made a point of trying every big cupboard. Sound effects are as they should be in such a lush environment (and I did like the little “clunk” and puff of dust that can accompany an unresponsive search), and the musical accompaniment was unobtrusive and never got annoying. I generally turn it a fair way down anyway when I have that option, which you do have here, so you can factor that into my comments. Eyes of Ara is completely mouse driven, and saves when you exit. It will simply pick up where you left off when you return. You can tweak settings, but not select subtitles, which matters little as there is no one to talk to, so no spoken word. You do read things though, and using the mouse wheel will zoom in and can make the task a little easier. 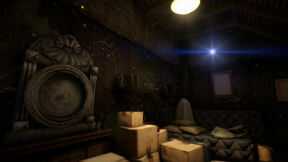 The plot involves the mysterious blue lights and the previous inhabitants. It unfolds through the journals and notes you find. It again helped to pull things together, but to me it was secondary to the castle itself and the smorgasbord of solitary puzzling that was within. You are by yourself, you don’t talk to anyone else, and there is no one else there to disturb you or to fiddle with things. What could be better? I spent about 13 hours exploring the castle and unravelling its interior, and I suspect I will indeed spend quite a few more.